2008 Dodge Ram 3500 Heavy Duty Quad Cab 4×4 Diesel Dually Pickup, VIN# 3D7MX48A28G248944, Cummins Turbo Diesel Engine, Automatic Transmission, 4×4, 270,169 Actual Miles, JBC AM/FM/Satellite Radio, AC & Heat, Power Windows & Locks, Tilt & Cruise, Power Cloth Seats, 12,200lb. GVW, Luverne Aluminum Running Boards, Cooper 285 70R17 Radial Front Tires, 285 70R17 BF Goodyear Radial Tires in Rear, Polished Aluminum Wheels, 7 1/2’x8 1/2′ Steel Flatbed with Built In Side Tool Boxes-2 Each Side, Chrome Bumper, Trailer Tow Package. 2017 Sharp Model 101-30’xTA Tandem Axle Aluminum Enclosed Gooseneck Trailer, VIN# 1S9GE3026H1870464, 14,000lb. GVW, 101″ Wide, x 7′ Tall x 30′ Long, Storage in Gooseneck Compartment, Folddown Rear Ramp, Side Door, Interior LED Lights, E-Track on Floor, 235 85R16 Radial Tires, Polished Aluminum Wheels (Like New). Road Boss 30′ Tandem Spread Axle Gooseneck Flatbed Trailer, 29′ Deck, 4′ Flip Up Rear Beavertail, 235 85R16 Radial Tires, Set of 5′ Aluminum Ramps, Electric Winch. (2) 2003 40′ Steel Storage Containers, Cargo Rear Doors, Wood Floors. John Deere 4010 Diesel Tractor, SN# 401021T58861, John Deere Diesel Engine, Synchro Range Transmission, 3-Point, Single Hydraulic Remote, 18.4-34 Tires, 3,491 Hours on Tach, John Deere 158 Hydraulic Front Loader with 7′ Bucket & Joystick Control. 1977 Ford Bronco, Automatic Transmission, 4×4, AM/FM/Cassette, BF Goodrich Radial All Terrain Tires, 33×1.50R15 Radial Tires, Trailer Tow Hitch. 1948 Jeep Pickup, 4-Speed Transmission, 4×4, Step Side Box. 1947 Willy’s CJ Jeep, 4×4. Clark LP Gas Forklift, LP Gas Engine, 84″ Single Stage Mast, 7.50-12 Pneumatic Front Tires, 6.00-9 Solid Rear Tires, 6,000lb. Capacity. Caterpillar Model TC30 LP Gas Forklift, SN# 11X1318, LP Gas Engine, Hydrostat Transmission, 2,879 Hours on Tach, ROPS, 3,000lb. Capacity, 156″ 2-Stage Mast with Hydraulic Side Shift, Solid Tires. Uni-Cure 25′ Long x 14′ Wide Self Standing Paint Booth, Single Down Draft, Explosion Proof Fluorescent Lighting-10 Unit, Walk In Door, Dual Swing Doors, Filtration System, 3′ Exhaust Pipe, (3) Desiccant Moisture Filters & Amerex Industrial Fire Suppression System, Model IS18ABC & Model IS45ABC Extinguisher Tanks, Mechanical Release Module, Wheel Lock Alarm Bell, 60-Amp Main Breaker Panel, Reserve 60-Gallon Air Tank. Campbell-Hausefeld 10HP 120-Gallon Industrial Horizontal Air Compressor, Cast Iron Series, V-Twin Compressor. Curtis 15HP 80-Gallon Industrial Horizontal Air Compressor, R/S Series Curtis Air Dryer. Skat-Blast Dry Blast Cabinet with Dust Collector on Stand. Snap-On Portable Industrial Sand Blast Pot, Model YA441, SN# DB024470, Hose & Gun. Rhino Linings Model LP21-110 Low Pressure Rhino Lining System with Hoses. RTI Portable Freeon Recharge & Recovery Cart, R134A, 13 Hours, on 4-Wheel Cart, Model TC670-B, SN# 20802-150403-001, 115 VAC Single Phase, 7CFM. R & D Parts Washer Cabinet with 30-Gallon Barrel. Norco Oil Change Cart with Air Pump, 4-Wheel Cart. Baileigh Industries Heavy Duty 50-Ton Hydraulic Shop Press, Air Driven, Dial Gauge up to 85-Ton, Adjustable Height Platform. (7) 12’x25′ Wide HD Curtains with Clear Inserts. (1) 10’x25′ Wide HD Solid Curtain. Central Machiner 6″ Belt to9″ Disc Sander on Stand. Sears Craftsman 1/2HP Bench Grinder on Stand with Light. Performax 6″ Buffer on Stand. DeWalt Model DW870 14″ Steel Chop Saw. Gorilla Rack 4′ Steel Stand. Norco 20-Ton Air/Hydraulic Floor Jack with Extensions. (3) Performance Tool Engine Stand, 1,250lb. Capacity, 4-Wheel. Norco 1250lb. Capacity Engine Stand. Napa 3 1/2 Ton Hydraulic Floor Jack. Pair of 20-Ton Heavy Duty Jack Stands. (2) Pair of 3-Ton Walker Jack Stands. Heavy Duty 2-Wheel Cart with Pneumatic Tires. (2) Shop Vac 12 Gallon 6.5 HP Stainless Steel Wet/Dry Vac. Set of (4) 4-Wheel Steel Car Dolly Movers. ATD High-Reach Jack Stand, 2-Ton Cap. FS Curtis Stationary Industrial Air Dryer with Dual Filters. Xtreme Garage Model P-200AT Multi-Purpose Utility Mini Air Mover. Set of 20-Ton Jack Stands. Advance Terra Model 128B Commercial Walk Behind Floor Sweeper, with Elec Motor. Mr. Heater Contractor Series 125,000 BTU LP Gas Shop Heater. Scale Weighing Systems Floor Mount Platform Scale with Model SWS LP 7510 Digital Scale Readout System, 10,000lb. Capacity by 2lb Increments. DeWalt Model DW708 Compound Sliding Mitre Saw on Aluminum Stand. Mac Model JSTTA1000 Hydraulic High Lift Transmission Jack on 4-Wheel Cart, 1000 lb. Capacity, 2-Stage (Like New). Welding Curtain on 4-Wheel Rack. Skat Blast Dry Blast Bead Blast Cabinet, Dust Collector, on Stand. 6′ HD Wood Shop Bench with 8″ Jorgensen Bench Vise. Baileigh Technologies Shrinker/Stretcher with Attachments. Xtreme Garage Model HV400 Multi-Purpose Blower Fan on Cart. Large 18″ Squirrel Cage Fan with 1HP Electric Motor on 2-Wheel Cart. Fostoria “Heat Wave 15” Portable Electric Heater, 62.5 Amps, Model FES-1524-1A, Ceiling Mount, 15KW, Single Phase. Norco Model 72000D 1 1/2 Ton Hydraulic Transmission Jack. Mighty Vac Model MV7300 Air Operated Fluid Vac. HD Wood Shop Bench with Pony 6″ Vise with 3/16″ Steel Top. Evolution Rage II Heavy Duty Steel Chop Saw on Stand. 2 & 5 Gallon Gas Cans. Portable Oil Change Cart on Wheels with Pump. Lincoln 30-Gallon Portable Gas Caddy with Hand Pump. 275-Gallon Steel Tank on Legs with Waste Oil. (2) HU-Lift 5,000lb. Hydraulic Pallet Jacks. (3) USC Handi Spray H.D. Dispenser Spray Units. Astro Pneumatic Tool Co Model 4550A Air Operated Paint Shaker on Stand. 2014 Edwards Model 55-Ton HD Ironworker, SN# 07808141W55, 5HP Single Phase Electric Motor, Foot Control, Emergency Stop, Punch, Shear, Angle Shear, Brake Attachment with 4-Way Die, Notcher (Like New Condition). 2015 BendPak Model 1502-BA 302 Hydraulic Tubing Bender, SN# 11591-001, 5HP Single Phase Electric Motor, on HD 4-Wheel Cart, Digital Program Data Control Panel, Flaring Tool Attachment, Expander & Coupler Unit, Dies up to 2 1/2″ Tubing. 2014 Baileigh Rusch Model M250 HD Steel Tubing Bender on Cart, SN# 37901244, Single Phase, 10′ Bed, 3-Jaw Chuck, Dies for 1 1/2″-3″ Pipe, Digital Readout, Foot Control. 2012 Baileigh Model C-400 Industrial Pedestal Steel Band Saw, SN# 1208014, 13″ Capacity, Work Light (Like New). 2013 Baileigh Model BB-4816M Metal Brake, SN# A13020336, 16-Gauge Steel, 4′ Brake Area, Foot Control, Several Individual Finger Dies, 4′ Die with Various Size Brake Points (Excellent Condition). Jet Model J-2550 20″ Variable Speed Floor Pedestal Drill Press, 1HP Single Phase Electric Motor, HD Wilton Vise. South Bend Gap Bed Engine Lathe, SN# CL31450, 6′ Bed, 13″ Swing, 3-Jaw Chuck, Bostar Model 250-111 Precisiion Tool Post, Forward & Reverse, Filings Tray. 2016 Baileigh Model SH-5214 Industrial Metal Shear, SN# 121164, 4′ Cutting Width, Front Gauge, Back Gauge, Back Cut Off Tray, 16-Gauge Mild Steel Capacity, Pedestal Emergency Shut-Off & Foot Control. Bridgeport 1 1/2HP Vertical Milling Machine, Model J, SN# J-127985, Tibon 4′ Floating Table with X, Y & Z Axis, Bridgeport HD Clamp, Bridgeport Rapid Traverse Attachment, Collette Rack, Excellent Condition. Large Inventory of Flat Steel, Tubing Steel (Round & Square), Angle Iron, C-Channel. 2017 GYS Body Protect Technology GYSpot Model BPLCX Invertor Spot Welder, Made in France, SN# 1510011052, on 4-Wheel Cart, 3-Phase, 7 1/2HP Electric Motor, Digital Panel Readout, Several Welding Attachments: X Clamp, Single Clamp, Size 9, 8 & 4 C-Clamps. (3) Miller Millermatic 140 Auto-Set Portable Wire Feed Welders on Carts, SN# MC151811N, SN# MD411857N, SN# LK261916N. Hypertherm Power Max 45 Portable Plasma Cutter, Leads & Gun. Miller Millermatic 251 Portable Wire Feed Welder on Cart, SN# LG180880B, (2) Tanks, Leads & Miller Gun, Miller Spoolmatic 30A Alum Spool Gun Attachment. Alkota Extreme Performance Model 330X4 Portable Steamer Pressure Washer on Cart, SN# 281895, 2HP Electric Motor, 4-Wheel Cart with Pneumatic Tires, Hose Reel with 100′ of Hose & Spray Wand. (2) Napa 10-Ton Hydraulic Porta Powers with Cases & Attachments. Norco 10-Ton Hydraulic Porta Power with Case & Attachments. RN Portable Battery Charger, 6 & 12 Volt, 100 Amp, Boost. DeWalt Model DW304P Electric Sawsall. DeWalt Model DWM120 Portable Hand Held Electric Band Saw with Case. Tool Shop HD 9″ Electric Angle Grinder. DeWalt DWE-112 4 1/2″ Electric Angle Grinder. DeWalt Model DW361 Hand Held Electric Hand Saw. Makita Portable Sawsall, (2) Batteries & Charger, 18V, Flashlight & Carrying Case. (11) Double C Vise Grip Welding Clamps. (5) XL C-Clamp Vise Grip Welding Clamps. Manual Dual Tube Caulking Gun. Branick Model G300 Brake Bleeder Kit on Wheels. (7) Ford Rotunda Essential Service Tool Kits,- TKIT-2002D-FLM Kit, TKIT-2002-F/FM Kit, TKIT-2001-FLM K, T96L-1000-A Kit, T97T-1000-A Kit, TKIT-1999S-FLM/LT Kit, TKIT-2000-F/FM/FLM Kit & General Motors Compressor Service Set. Automotive Lift Institute Inc HD Floor Mounted Hydraulic Vehicle Hoist, 6,000lb. Capacity, (4) Swing Out Arms, (4) Extra Screw Type Lift Mounts & 1.7HP Hydraulic Power Unit on Cart (Can Move Lift Around wherever Needed). Rotary Model SP0A10N500 Hydraulic Floor Mounted Vehicle Lift, SN# BVP050D0722, 10,000lb. Capacity, 2HP Electric Motor, Swing-out Extendable Arms (Very Good Condition). Grey Porta Matic Car & Truck Air Lift, 5,000lb. At 200lbs Air Pressure, Air over Hydraulic. 4-Wheel Rotisserie Car Hoist with Dual 3-Ton Jacks. Hunter Model TC3250 Commercial Air Tire Machine, SN# 102505027, Rim Clamp, Foot Controls. Cheetah Model CH5 Bead Seater. Snap-On Model EEWB204A Tire Balancer, SN# G61MW018, Digital Readout, Swing Down Cover. (7) Goodyear Model 46731 Wall-Mounted Air Hose Reels with Hose & Quick Fill. (3) Reel-Craft Model RT605-CLP Auto Air Hose Reels with Hose & Quick Coupler. (3) Flexzilla Wall Mount Zilla Reel Air Hose Reels with Air Hose & Quick Coupler Chucks. 10′ HD Island Style Steel Storage Rack with (4) Shelves on Each Side. (10) Sections of HD Steel Pallet Racking, 7 1/2′ Openings, 2 Shelves Each, 8 1/2′ Uprights. 1-Section of HD Steel Pallet Racking with (3) Shelves. HD Shop Cart on Wheels with 4 Shelves. Rubbermaid Heavy Duty Shop Cart with 2 Shelves. 6′ Heavy Duty Steel Work Table with 6″ Vise. Heavy Duty Steel Shop Rack on Wheels with (4) Adjustable Height Shelves. (7) Fastenal 4-Drawer Parts Cabinet with Inventory-Electrical Parts, Grommets, Stainless Steel Screws, Washers & Bolts; Flange Bolts, Washers, etc; Machine Screws, Nuts & Washers; Cable Clamps & Spring Nuts; Dome Caps, etc. Fastenal 18-Drawer Steel Parts Cabinet with Inventory. (7) Gorilla Rack Heavy Duty Metal Shelf Units on Wheels with (4) Shelves Each-(6) 8′ & (1) 6′ Wide. Gorilla Rack HD Metal Shop Rack, (2) 4′ Sections, 17″ Deep, 2-Shelves Each. Gorilla Rack Heavy Duty Metal Shop Bench, 10 1/2′ Long, 30″ Deep, 3/16″ Solid Steel Top, Lower Shelf. 4-Wheel Adjustable Height Shop Cart. (3) 4-Wheel Rolling Shop Carts with 2-Shelves Each. Heavy Duty Metal Rack with Adjustable Shelves. Norsemann 4-Drawer Steel Drill Bit Cabinet with Drill Bits. (2) Heavy Duty 4-Wheel Rotisserie Type Carts for Hardtops. Perfomax 6-Drawer Tool Chest on Wheels with Ball Bearing Drawers. HD 4-Wheel Rack with (6) Clamps, Roll Bar Jig. Super HD Frame Building Table, 13′ Long x 5′ Wide Steel Top. (2) 4′ Sections of Gorilla Racking. (3) Sections of HD Pallet Rack with 11′ Openings (2 Sections are welded together), All have Welded Shelves. Gorilla Rack 8′ Steel Shelf Unit with (3) Shelves, 22″ D Shelves. (4) 15-Tray Assortments with Inventory. (2) Parker 40-Bin Steel Parts Bins with Inventory. (3) 72-Bin Parts Cabinets with New Bolt, Nut, Washer Inventory. (2) Jet Horizontal Roller Support Stands. (3) Sections of Gorilla Rack Steel Shelf Units. 2-Door Heavy Duty Steel Storage Cabinet with 6 Interior Shelves. Gorilla Rack 5-Shelf Steel Shelf Units. (2) Heavy Duty Steel Welding & Shop Table, 4’x3′ with 1/2″ Steel Top, Lower Shelf. Gorilla Rack Metal Shelf Unit with 2-Door Locking Cabinet. (2) Blue Streak Metal 5-Shelf Cabinets. Gorilla Rack 3-Section Shelf Unit with (6) Locking Cabinet Doors & (2) Slide Out Drawers, (1) Lower Shelf. Gorilla Rack shelf Unit, 8′ with (2) Shelves. ATD 4-Roll Tree Style Tape Masking Machine Cart. (5) Aluminum Folding Body Stands. (2) Heavy Duty Steel 4-Wheel Painting Racks. (2) Steel 4-Wheel Painting Racks. (2) Fluorescent Dual Light Body Work Light Carts on Wheels. (3) 4′ 4-Bulb Wall Mount Fluorescent Lights. Engine Run Stand on 4-Wheels for V-8 Ford Gas Engines, Exhaust Headers & Mufflers, Frame, Battery, Starting Controls, Radiator, Set of for Fuel Injected & Carbureted. Metal Shop Foreman’s Desk with Drawer & Lower Shelf. (35) 289 & 302 V-8 Gas Engine Long Blocks. (5) 6-Cylinder 173 & 200 Straight 6-Cylinder Gas Engine Long Blocks. (8) C4 Automatic Transmission Cores with Gears & Torque Invertors. (70) Bronco 3-Speed Differentials (Rat, Ran & Misc). Approx (150) Radial Arms for Suspensions of Early Broncos. (5) V-8 302 Fuel Injected Gas Engines, Full Blocks. (30) T-Shift Transfer Cases & (17) J-Shift Transfer Cases. 3-Speed Bell Housings (Approx 35). Pallet of Manual Steering Boxes (Approx 40-50). Pallet of Auxiliary Gas Tanks (Approx 8-10). (5) Sets of Long Tube Headers. Approx. (40) Valve Covers for V-8 Engines. Pallet of (15) Various Heads for 289 & 302 V-8 Gas Engines. (15) Ford 9″ Rear Axle Shafts. Power Steering Pumps (Approx 6-8). 3-Speed Transfer Case Housings (Approx 11). Set of (5) Goodyear 35×12.50R17 LT Wrangler Radial Tires, Kevlar Reinforced Sidewalls, Model MT/R. Uline Nylon Banding Cart with Tools & Supplies. 6′ & 8′ Folding Banquet Tables. BEA Heavy Duty Box Stapler. Peluze Model 4040 Table Top Platform Scale with Digital Readout. Shrink Wrap Holder with Roll. Brown Paper Dispenser on Stand. Several Rolls of Clear Tape. AUCTIONEER’S NOTE: 5% Buyer’s Premium Applies to All Purchases. Make your plans to attend this Large & Interesting Auction. 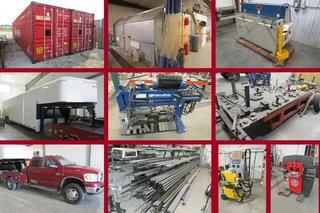 This is a complete Wall-to-Wall Liquidation Auction for Bronco Connection, LLC. And all assets will be sold at Absolute Public Auction – No Reserves or Minimums! Furthermore, all of the New & Used Ford Bronco Parts and Accessories are being offered on an Online-Only Auction in the days leading up to the Live & Online Auction at the Bronco Connecion, LLC Facility in Norfolk, NE. For Further Information, Questions or Assistance, Please Contact the Auction Company at (402) 727-8800 or visit us on the web at www.nitzauctions.com. There are literally thousands of photographs of the items that are being offered on both the Live & Online Auction and the Online-Only Auction. Lunch & Restrooms on Grounds at the Live & Online Auction. Previous Inspections on the Live & Online Auction assets on Friday, September 28, 2018 from 9:00 AM to 5:00 PM and Auction Day Only Please. 5% Buyer’s Premium Applies to All Purchases. 1. All prospective purchasers will be required to register for a bidder’s number and present proper identification when registering. 2. All purchases must be settled for, IN FULL, on Auction Day. Payment may be made by cash, personal or business check. All checks will be made payable to Jack Nitz & Associates, Inc.
3. No equipment will be removed from the Auction Site until settled for. Post Auction equipment removal arrangements must be made with the Auction Co. Or Seller if purchaser wishes to leave equipment overnight. 4. Once the Auctioneers say “Sold”, the equipment becomes the SOLE RESPONSIBILITY OF THE PURCHASER. 5. ALL SALES ARE FINAL. All property is offered in “AS IS, WHERE IS” condition, unless otherwise specified by the Auctioneer. NO WARRANTIES, EITHER EXPRESSED OR IMPLIED, will be offered. 6. All Sales are Subject to the Sales Tax Laws in the State in which the Auction is being conducted. 7. The Auction Company reserves the right to reject the Bid of any purchaser or revoke any/all bidding numbers from any purchaser, who in the past has presented a problem for collection to either the Auction Company or Seller. 8. Announcements from Auction Block on Auction Day will take absolute Precedence over any matter of print (Catalogs) or any matter of previously printed advertising. 9. Any Purchaser will be expected to rely upon his/her personal inspection or investigation of the property being offered at the Auction, and not upon any representation of warranty or condition by the seller or the Auction Company. 10. Any/all returned checks from purchases made at any Auction will be Subject to a $35.00 return check fee and will be sent immediately for collection to the Check-Mate Collection Agency.